How Many Years Can You Expect To Live In Bad Health? What if you had an idea of how long you'll live? What about if you knew how long you'd live in good health? Living in good health versus simply living long highlights an important concept: the number of years we live may not be so important as the quality of life in our years. 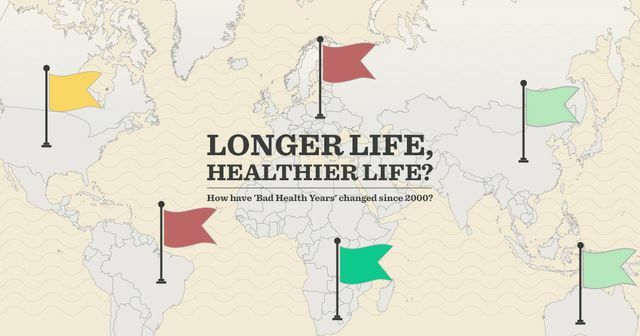 To that end, consider this recent infographic shared by medigo.com that focuses us on an idea of the number of bad health years we can expect to experience. Subtracting the number of expected healthy years we have (Health Adjusted Life Years, or HALE) from median life expectancy gives us an idea of just how many years we can expect to live in, unfortunately, bad health! Of course, there is a distribution underlying median life expectancy. Perhaps we will live far longer (or less) than that typical number. Similarly, the HALE may not easily be applied to any one person. But, that said, isn't it interesting to look at the infographic (click the link below) and see how, by continent, the number of years where people can be expected to live in bad health varies! The average human being is living longer than ever before. Nearly every country on the planet has seen an increase in life expectancy since the beginning of the 21st century. But though we are living longer, not all of us are living healthier. Health Adjusted Life Expectancy (HALE), or healthy life expectancy, is a metric used by the World Health Organization to measure the number of years a person can expect to live in good health, taking social and economic factors into account alongside disease and disability rates. When we deduct healthy life expectancy from actual life expectancy, we see the average amount of years someone can expect to live in bad health – or 'Bad Health Years'.